The iconic R.J. Reynolds building, that now houses the Kimpton Cardinal hotel is an historic landmark and treasure to our beloved Winston-Salem. 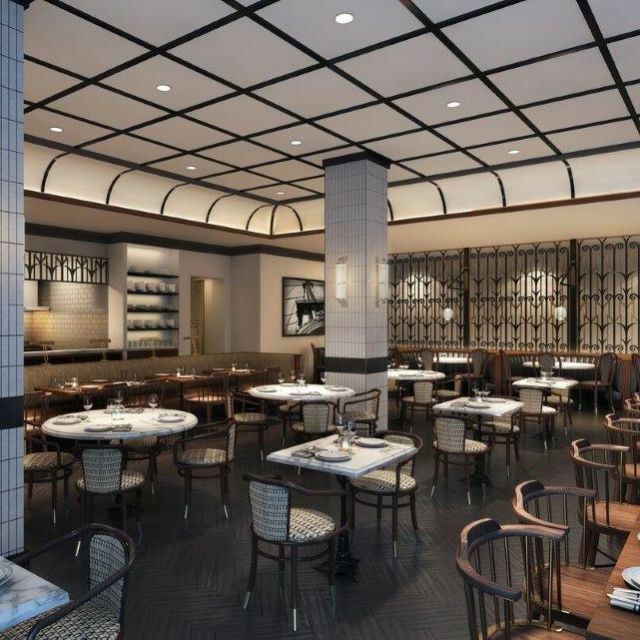 When it was announced, publicly, in 2014 that it was going to become the newest in the Kimpton line of boutique hotels (and also an apartment complex managed by PMC Group), there was also the announcement that there would be a restaurant on the ground floor. We found out later that it would be a French brasserie that occupied the spot. Excitement erupted in the area. Commanding that space to a somewhat fickle community, one that takes their historic buildings and properties very seriously, was going to be a feat. How would this turn out? How would the community react? Would it be accepted or rejected? Would there be hype and then it fall on its figurative face? A lot of questions to be answered there. Add on the fact that it was going to be a French Brasserie and they were going to have an even bigger challenge. For some reason, it seems Winston-Salem has a problem with food that isn’t the “Nouveau Southern” or tried-and-true ethnic foods such as Mexican, Italian, Chinese or Japanese, etc. And even those, they’re the Americanized versions, usually. Greensboro definitely one-ups Winston-Salem on the ethnic front. One way, I suppose, to combat the naysayers is to name the restaurant after one of the most important women in our city’s fine history, Katharine Smith Reynolds. Katharine was the wife of the founder of the empire that spawned the very building in which they’re located, R.J. Reynolds. So, the brasserie was called The Katharine Brasserie and Bar. Clever name, to be sure. Still, they had to live up to that. Stephanie and I decided to give the restaurant a try and see how it stacks up to the Parisian restaurants that we’d eaten at both times we’d been to Paris. We used Open Table to secure the reservations, which weren’t until 9pm. They were quite busy on a Friday night, something that is good to see. We arrived at 8pm, however, because we wanted to experience the bar and the craft cocktails that were being advertised. The valet parking was a good thing. The hotel itself isn’t bountiful in the way of parking, but why do that if they’re going to do it for you, right? We checked in, stating our reservation wasn’t for a while but we were hoping to enjoy some libations. They said absolutely and they would retrieve us when our table was ready. The bar reminded us of the hotel bar in the Hotel Chicago when we stayed there back in August, 2015. Very metropolitan and more extravagant than anything else in Winston-Salem. However, it was very welcoming and the staff behind the bar was nice, all smiling and friendly. Stephanie stated, while we were sitting sipping our beverages, that the feel and look, combined with the view out the windows (which was just the back end of One West Fourth) made it feel like we weren’t actually in Winston-Salem. What she meant by that was it made this city, that wants to be like other, larger cities seem much larger than it really is. We saw it as something with more of a big-city feel than we have really seen here before. It made us feel like we were traveling, knowing when we walked outside we were still in the comfortable arms of the city we love. The bar area was also very spacious and resided “downstairs” from the main dining room. Proportionally, there was ample seating, with many seats around the bar itself and counters and tables, both high and short, complete with chairs throughout. The cocktail menu was full of lovely craft offerings and many were named after things, situations or places that somehow related to where the bar/brasserie is. One thing that I found funny was that Brasserie in French means “brewery.” The Katharine was sans an actual brewery. There was, however, a raw bar that offered oysters, clams and other “raw” items that you can munch on to tide you over. 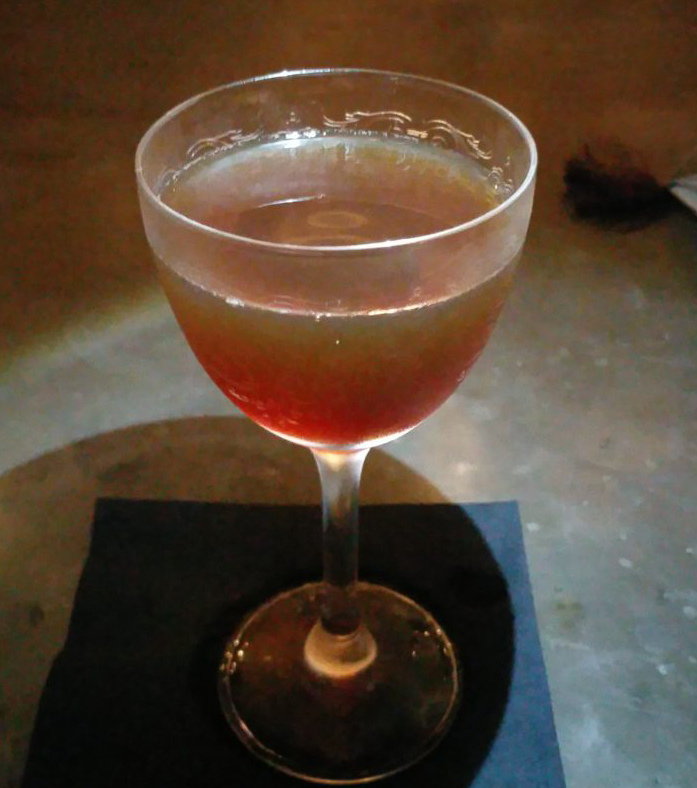 I tried the Waldorf which is like a classic rye Manhattan but with Absinthe added. It was a little heavy on the vermouth but delicious otherwise. 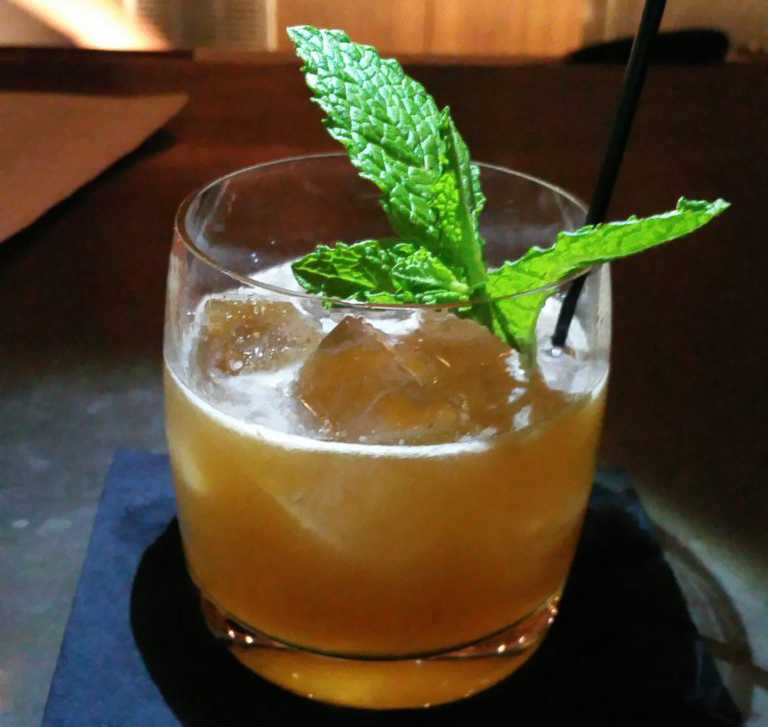 I also had the Empire State Smash which was Appleton signature blend, muddled lemon, bitters, cinnamon and mint. This was the cocktail of the evening for me. Very smooth. 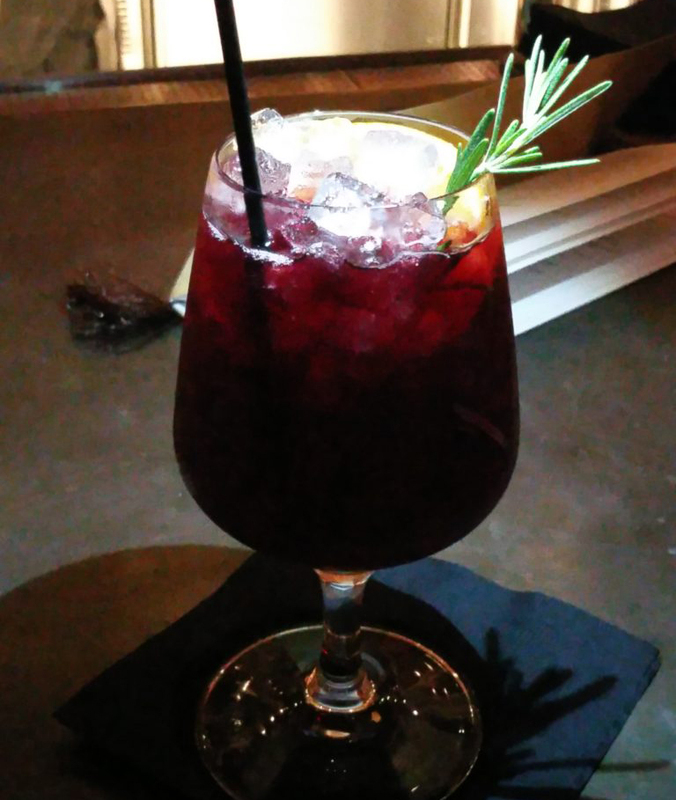 Stephanie had the Claret Cobbler which was the house red wine, Black Grouse scotch whisky, lemon and rosemary. Think of a sangria but with some extra kick and spice. She was quite happy with it. It was time for dinner. We were seated in a large dining room at a table that we were able to sit, side-by-side, on deep-cushioned bench seats. We usually sit facing each other because it is easier to have a conversation. These seats were comfortable. Our server was a lovely, young, British lady by the name of Lucy. Bread and butter were brought to the table while we were looking the menu over to decide what we wanted to have. I ordered a Leffe Brune, beer. Lucy asked if she could pour for me and I agreed. There was a beautiful, foamy head in the glass. She poured well. I had an opportunity to look around at the grandeur that is the dining room. There’s an open kitchen that allows you to see the action happen. You’re not close to the action but you can see the kitchen staff scuttling about. The restaurant was a lot of tile and very Art Deco, which would make sense since the building is classic Art Deco. It’s also very much French in feeling and atmosphere. But, you’re wondering about the food, right? 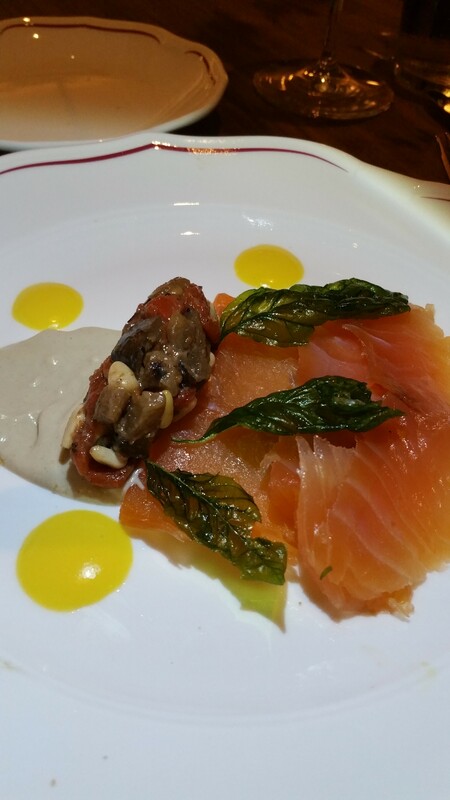 Stephanie ordered with the House Smoked Salmon with eggplant, basil, oven-dried tomato and pine nuts appetizer. The eggplant was in a chutney form and the sweet from the chutney combined with the acid of the tomato, the crispiness of the sauteed basil and the nuttiness of the pine nuts paired very nicely with the smokey and savory flavor of the salmon. The portion was plentiful for an appetizer. create a “sauce” for the tartar. While I would have liked it to be a slight more runny, it added grand flavor. There was a flavorful hint of sea salt and black pepper but not overpowering, at all. The jalapeño added a crunch and slight spice to the mix. However, the star of that dish was the beef itself. It’s quite the French treat. 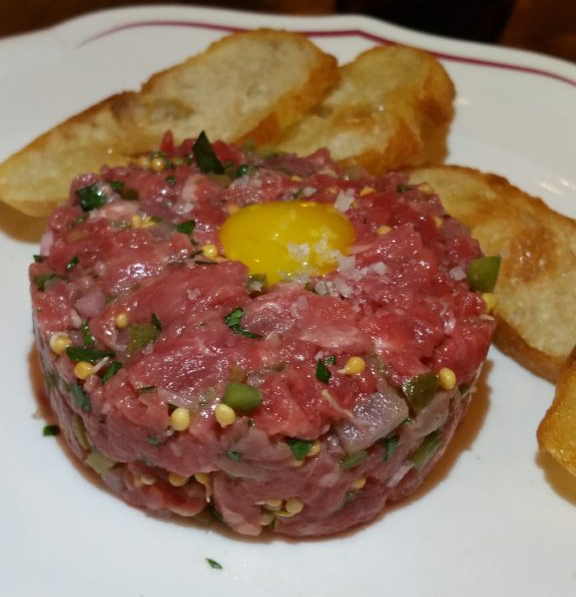 When we celebrated our honeymoon in Paris, I had beef tartar for three of the four nights we were there, all at different locations. This was a good interpretation. I could eat that over and over again. It was served with crostini and I saved it for afterward; kind of like a dessert for my appetizer. For her entree, Stephanie ordered the 8oz Bistro Filet, cooked medium, and she chose the Béarnaise sauce to accompany her steak. 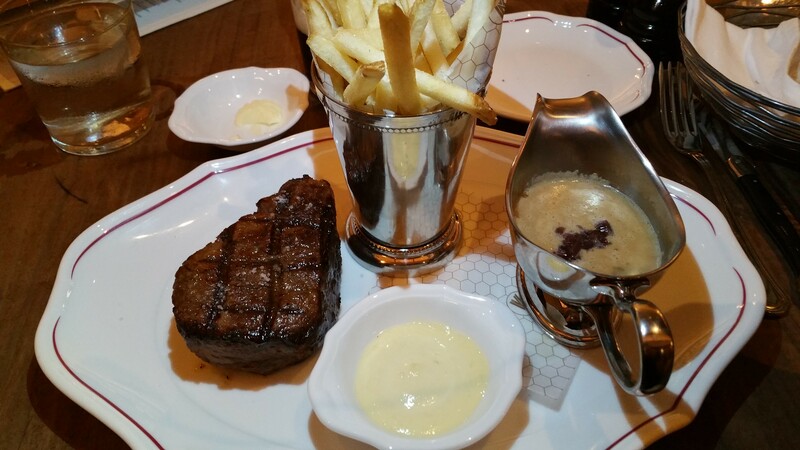 The “side” for the steak is always frites, or french fries as we call them. The frites were served with an aioli, again, as you’d find in the French bistros. 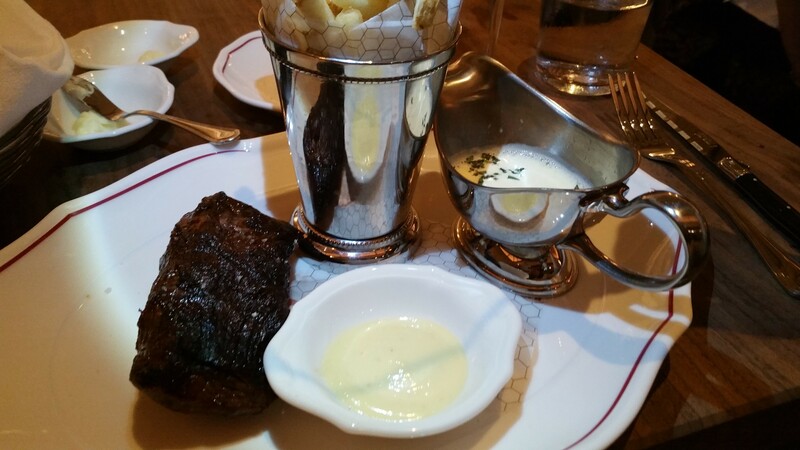 The Béarnaise sauce was super buttery, sweet and delicious. The knife carved through the meat effortlessly. She did say that the kitchen sent the steak out exactly how she ordered it, however, next time she’ll order it medium rare as it was a little more done than she expected. We have found when we go to a restaurant for the first time, we have to gauge the kitchen’s ability to cook it how we want it. The flavor of the filet combined with the sauce was, in her words, “oh my gosh, it was good!” She had the Château Bonnet red with her meal. My entree was the 10oz beef tenderloin, cooked rare, and I chose the foie gras sauce to go with it. Foie gras is an acquired taste to many, but it certainly is French and was good and a bit fatty. My steak, too, had the frites with aioli. To be fair, my steak was a bit thick and while the very center was rare, the outer layers were a bit more medium. So, I did, as with Stephanie, get my steak the way I wanted it, but with it being that thick it was hard to get it just right. The important part, though, is the flavor and that was perfect. There was a nice rigid crust on the outside and the seasoning was spot-on. I can’t really get less than rare but I’ll continue to ask for rare. Excellent job on it, otherwise. 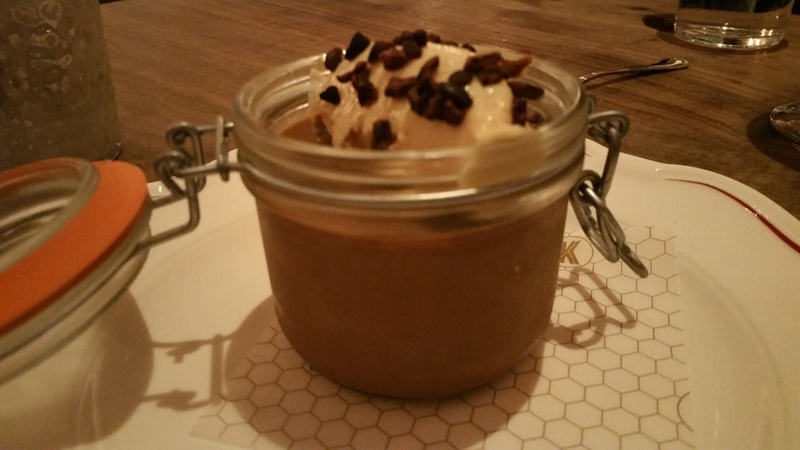 After dinner, I had a pour of Grand Marnier while Stephanie and I shared the Dark Chocolate Pot de Creme which was a chocolate mousse that had whipped cream and broken dark chocolate “sprinkles” and it was served in a resealable swing-top container. It’s all for looks and not very practical because you’re not going to take that home with you. But, the mousse was creamy, velvety and delicious. And I’m not really a chocolate fan. In my experience, this was the smoothest running “new” restaurant that I’ve seen. I saw no real operating kinks to work out and the food was near perfect. If I had to pick something that was a negative, it would be that the entire establishment, from the bar in the front to the dining area in the back, is very, very loud. There are a lot of hard flat surfaces as well as contours in the ceiling. Sound bounce everywhere. I sat right next to Stephanie and it was hard to hear what she was saying and Lucy, our server, had to almost get in our face for us to hear what she was saying to us. I believe they could incorporate some sound-absorbing acoustic tiles that fit the aesthetic and theming that the Katharine is trying to achieve. The servers are dressed casually, bringing a bit of a relaxed environment while still delivering a fine dining experience. The prices are what you’d expect from a fine dining establishment. You can spend beaucoup money if you’re not paying attention. But, if you go in with a budget, you can find a good meal for yourself (or more) at a decent fine dining price point. As I said at the beginning of this article, there was a lot of hype and hoopla about this restaurant; big hype to live up to. In my opinion, they certainly rose to that expectation. 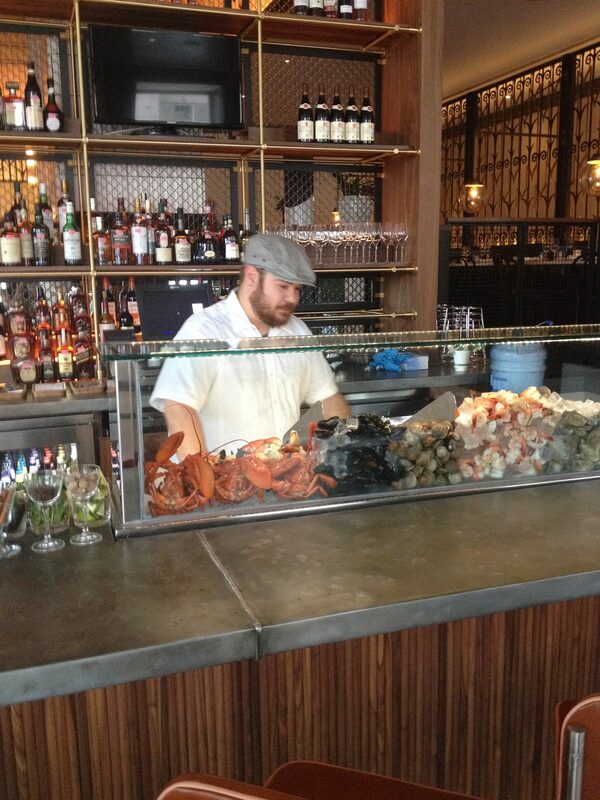 From the bar, the libations and decor to the service and food, the Katharine has gotten it right. There’s now a place with a larger metropolitan feel in Winston-Salem and I’m hoping this situation becomes a trend. The city has a true winner in The Katharine Brasserie and Bar. The Katharine Brasserie and Bar is located at 51 4th St E #100 (the corner of 4th & Main) in downtown Winston-Salem. You can find more about the menu by looking on the “Menu” page of this blog. Call (336) 761-0203 or visit Open Table to make your reservations.